I’m grinning like a Cheshire cat and welling up with pride as I sit poised to write this post. Meet Nikita, the sister of Jessica who was the lovely recipient of my first ever hand-made prom dress. I knew there was another one on order, a year ago. After all you can’t make for one without the other can you?! But what joy. What an absolutely pleasure to have another opportunity to make such a special dress. I’ve learned one hellofalot in this last year. Fitting mostly. This little beauty only took two fittings. I quite forget how many Jessica’s one took! I’ve learned not to be scared of cutting into the fabric. Learned how to be honest with measurements, how to be brave with fabric choices and mostly that I CAN make a dress befitting of a princess! 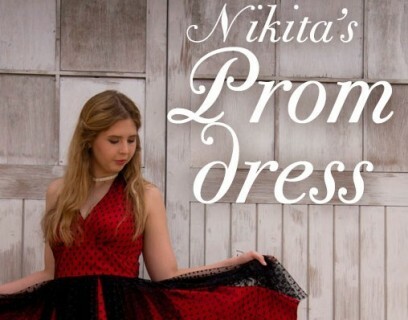 Up until a few weeks ago, all Nikita’s dreams of her school leavers prom were wiped out when her school declared no funds for such frivolities, after all, this year. Everyone was gutted for her. Especially knowing how hard Nik has worked throughout her last school years… despite being asleep for most of them! Normal teenage behaviour you might assume but no, unfortunately for Nikita she suffers with narcolepsy. An awful condition which means she has to take very strong medication to keep awake. Lots of things trigger a collapse. Not least of all a fit of the giggles. I reprimanded her dad recently, for his insistence on telling jokes one after the other but Nikita assured me it was fine because his jokes were so rubbish! She has the best S.O.H. ever! It was such a relief when her school confirmed the prom would actually go ahead. But then a little panic set in when I realised I had a couple of weeks to pull off the dress. By now you have the right to safely assume that Mr Ooobop, AKA the lovely Daniel Selway has been behind the creation of these blinding photos! Helped by a scorching summer’s day and the beautiful setting of Fulham Palace, he has blown me away once again with his amazing self-taught skills.The dress itself is fashioned from the same materials as Jessica’s, only in stronger colours. 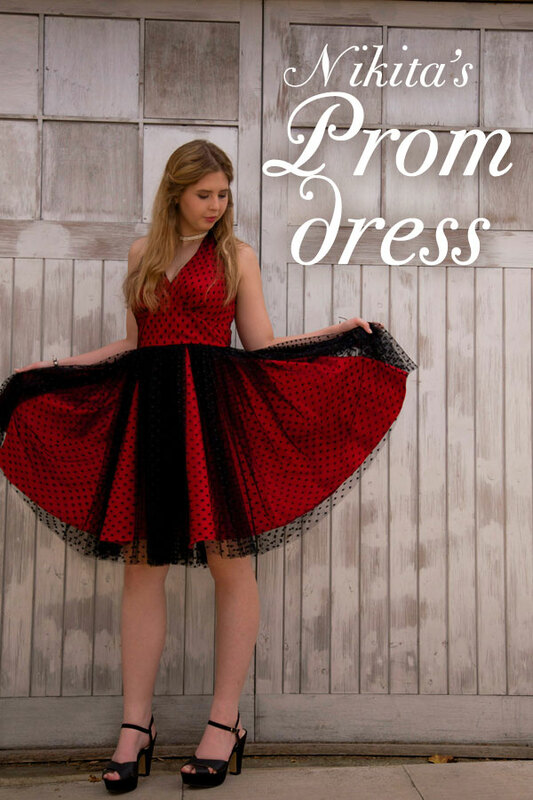 Red Duchesse Satin and Black polka dot tulle. The halterneck bodice section is Simplicity 3825. Inspired by Nikita’s leaning towards a Marilyn-esque dress. I’ve had this pattern in my collection for some time and I’m so glad it came into good use. I basted a layer of the dotted tulle over the bodice pieces and treated them as one for the outer pieces. 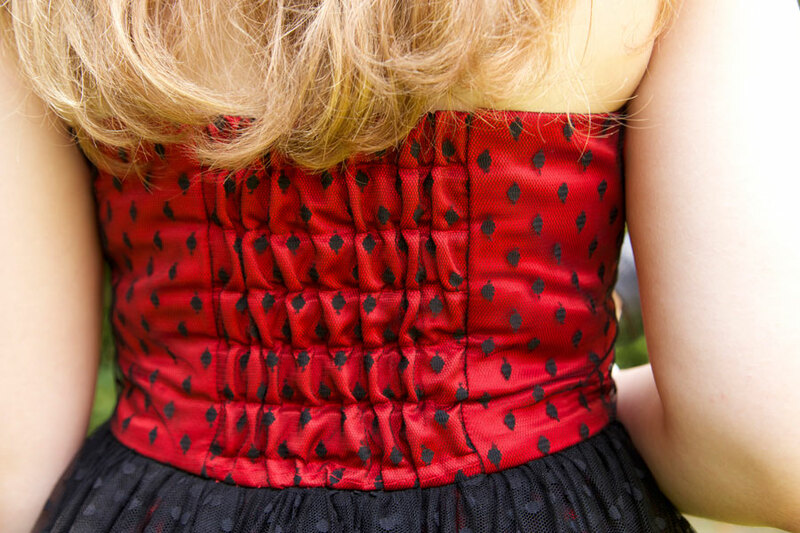 Inside the bodice is self lined with the red satin. Its a good medium weight and gave the dress some necessary structure whilst not losing out to optimum swishy drape for the skirt. Oh just look how divine her smile is! The skirt is a full circle, of course. One can’t pose over street vents if the skirt doesn’t rise above one’s head! But actually a more demure pose was to be found next to a water fountain in the grounds of Fulham Palace! The back of the dress is genius in design. It has a wonderful elasticated panel which keeps the bodice fitted nice and snug with no gapes. I just love the effect that is created with the gathered netting over the liquid shiny satin. I can honestly say that this dress is testament to everything I love about sewing. Not only about what I get out of the whole deal but what everyone else gets too. 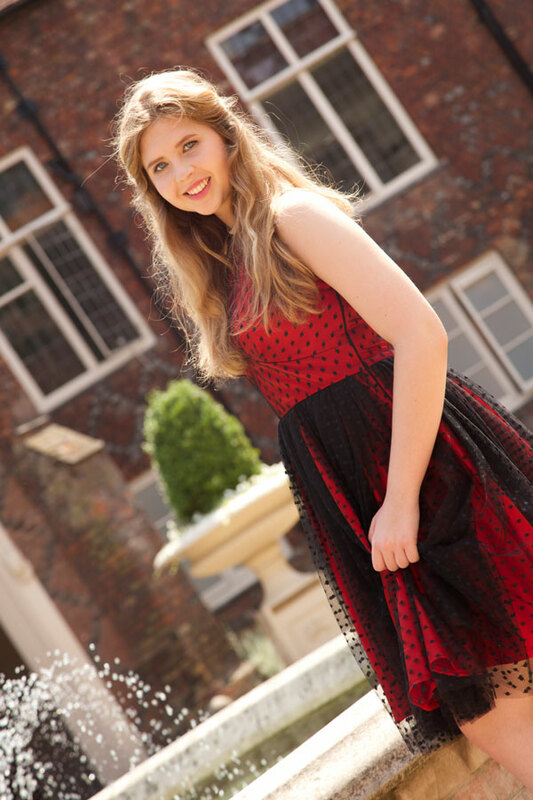 Nikita loved her dress and I feel so honoured to have made an original number for her. Mummy Tina was delighted to see her daughter have the best time in her new dress, Daddy Tim was very happy that I’d fulfilled the brief of a ‘modest’ dress and we are all so happy with Daniel’s outstanding photos. Nikita will do well with whatever she choses to do. Of that I am sure. Nothing is going to hold this little lady back!